Recently filmmakers and tastemakers attended the "Storytelling Through Film" brunch at the Stella Artois Filmmaker Lounge at Sundance Film Festival. Joining forces with water.org and co-founders Matt Damon and Gary White attendees of the brunch learned about the global water crisis. While enjoying innovative beverages by Stella Artois and a delicious peruvian-inspired brunch, attendees did their best to #leaveamark. During the brunch water.org co-founder Matt Damon discussed the increasing issue and what we can do to assist in aiding the crisis and shared personal testimonies of the power of social media and film. "(We are) Helping people and using film as a vehicle" documentary filmmaker Crystal Moselle stated. "We're trying to get messages across so the whole world can hear a voice...our job is to tell their story," producer Fazeelat Aslam concluded. In support of the campaign, Moselle and Aslam have created a three-part documentary series showcasing the impact of the global water crisis on women and their communities in Haiti, Kenya, and Peru. Stay tuned to see the latest with Stella Artois and Moselle and Aslam regading filmmaking and shedding light to this issue. -As of January 2015, and announced by the World Economic Forum-the water crisis is the #1 global risk based on impact to society (as a measure of devastation). 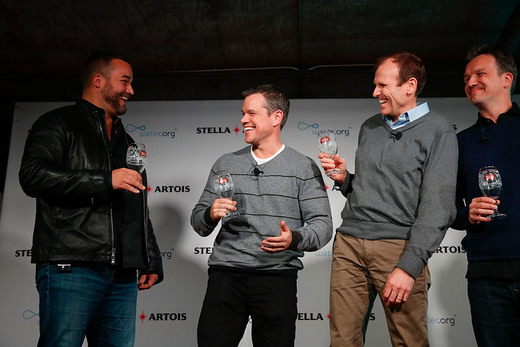 Water.org Co-Founders Matt Damon and Gary White participated in a panel session on January 23, 2016 along with Todd Allen, Global Vice President, Stella Artois, on the current global water crisis and what needs to be done to end the long water collection journeys many women in developing countries have to make each day. Photo CreditL Rick Kern/Getty Images for Stella Artois. Together we can make a difference to change and improve this global crisis. For more information click HERE to donate and click HERE to learn what you can do to make a difference to give women hope, children health, and communities a future.